Summary: Jonathan Franzen wrote in The Daily Beast that “no other writer, as far as I know, has invented such a funny and compelling voice and story for [this type of character. ]” Now, in The Love Song of Jonny Valentine, Wayne turns his sharp wit, flawless narrative ventriloquism, and humane sensibility to our monstrous obsession with fame. Megastar Jonny Valentine, eleven-year-old icon of bubblegum pop, knows that the fans don’t love him for who he is. The talented singer’s image, voice, and even hairdo have been relentlessly packaged—by his L.A. label and his hard-partying manager-mother, Jane—into bite-size pabulum. But within the marketing machine, somewhere, Jonny is still a vulnerable little boy, perplexed by his budding sexuality and his heartthrob status, dependent on Jane, and endlessly searching for his absent father in Internet fan sites, lonely emails, and the crowds of faceless fans. Every once in awhile, I stumble across a book that manages to take me by surprise. 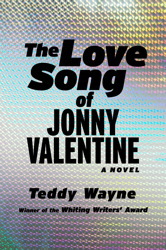 I rarely pick up books that I don't think I'll like, but THE LOVE SONG OF JONNY VALENTINE by Teddy Wayne really entertained me and captured my heart... much more so that I ever expected. THE LOVE SONG OF JONNY VALENTINE tells the story of an eleven year old mega pop star. While this young boy does have talent, his record label and his mom (who also happens to be his manager) have worked and reworked his image so that he can sell records and all the other products associated with tween superstars. Sounds a little like Justin Bieber, right? For most tweens, being an eleven years old is a time of huge change and most experience feelings of insecurity. It's no different for Jonny who is facing confusion about his new found sexuality and his desire to find his father. However, Jonny also has the pressure of selling more records and concert tickets and being in the spotlight 24/7. In addition, he doesn't want to disappoint his mother or anyone else dependent on him. THE LOVE SONG OF JONNY VALENTINE is a unique coming of age story about one tween boy's attempt to find himself while also navigating fame and the trappings that come with it. I absolutely adored THE LOVE SONG OF JONNY VALENTINE. It is such a smart and funny novel that also managed to tear at my heart. I pretty much loved everything about this novel -- from Jonny's character development, to his authentic voice, to the portrayal of music industry, to the social commentary on society and fame; and I especially think Mr. Wayne's prose was brilliant. You can't help but read THE LOVE SONG OF JONNY VALENTINE and not fall in love with Jonny. The story is told in his voice and I have to say that Mr. Wayne managed to bring to life a real eleven year old pop star. He is one of the most original and refreshing narrators (or characters for that matter) that I've come across in recent memory. He is at the age when boys waver between being little kids at one moment and full fledged teens (with hormones!) the next; and I thought the portrayal of him was pitch perfect. Maybe it's because I'm a mother of a young boy, but my heart just broke for Jonny. Because Jonny was so real to me, I felt sick that he he had so much pressure on him to be a success (or at least what his mom and record label considered a success.) He was still a young boy and I'm not sure that anyone thought of him as one. Rather, everyone wanted something from Jonny for themselves. And then there was the whole unknown father part of the story. It was all just so sad! However, I do not want to give the idea that this book was a depressing one because it most certainly was not.THE LOVE SONG OF JONNY VALENTINE was also one of the funniest books I've read this year. Despite wanting to cry for Jonny at times, there were probably more times during this story that I just laughed out loud. There were some very funny situations that Jonny found himself in, but I also found myself cracking up because Jonny's insights and perceptions about life and people were just spot on. I really can't rave enough about Mr. Wayne's writing style. He is that good! THE LOVE SONG OF JONNY VALENTINE is the first novel that I've read by Mr. Wayne, but it won't be the last. I was extremely impressed with is prose and dialogue, as well as his portrayal of Jonny; however, I also thought his social commentary on the music industry, pop culture and our society as a whole was fantastic. Trust me when I say that this book was as smart and witty as it was entertaining! I can't help but recommend THE LOVE SONG OF JONNY VALENTINE for book clubs. I was thrilled to see that there is a reading guide available with fourteen terrific questions. In addition, there are some unique ideas to enhance your book club meeting. Some of the topics you might want to discuss include parent/child relationships, fame, success, insecurities, secrets, pressure, and identity. In addition, it might be fun to talk about how Jonny's video game is a metaphor for his life! I can't rave enough about THE LOVE SONG OF JONNY VALENTINE. As far as I'm concerned, it's a must-read novel! I love it when I find a gem, and this one goes on my list. Beth is right, this book sounds like a gem of a novel. I love when authors introduce a character's voice that is so compelling you feel like you get to know the character so well. That does sound like Justin Bieber! lol This book sounds fantastic! I can't stand Justin Bieber so much I wonder if it would affect my reaction to this book! I made note of this book when I did a fiction order a few weeks ago and I'm glad to see it's worth the read! I saw it right after I finished a book that kind of sounded like Lindsay Lohan so it clicked with me to add it to my TBR list. This sounds like a unique subject. I hope I can read it without thinking about Justin Beiber!